Now, however, troubles by the eruption are limited. You cannot enter ONLY the 4km-radius cautionary zone from the summit of Mt. Ontake. It doesn’t affect ordinary lives and travel in other areas. All trains, buses, roads in Nagano Prefecture are operating as usual. Tsumago, Magome, and Narai historic post towns of Nakasendo, which are popular sightseeing spots with walking courses among foreigners, are more than 30 km away from Mt. Ontake and can be traveled safely. Oct 11, I actually hiked between Yabuhara to Narai post towns via Torii Pass, the highest point on the historic Nakasendo highway that connected Kyoto and Tokyo in the Edo Period and before. Mt. Ontake, the 3067-meter volcano towering over the west side of the Kiso Valley, erupted around noon on Saturday 27-Sept. The mountain is popular for climbing, and all climbers have or are in the process of evacuating the mountain. According to the Nagano Prefecture Tourism Department, Mt. Ontake has been closed for climbing until further notice. Nearby Route 19, the main highway along the Kiso Valley, as well as the JR Chuo Line which also runs along the Kiso Valley, and the Chuo Expressway which runs one valley over, are all 0perating normally. The only area to be affected by the eruption is a 4km-radius cautionary zone that has been set up around Mt. Ontake for danger of falling ash. If/when the prefecture’s Tourism Dept. offers new information, the Go-Nagano blog will be updated accordingly. Always wanted to snowboard like a pro? . . .here’s your chance. This weekend, January 30th and 31st 2010, Burton snowboarder Michiyo Hashimoto will be rippin’ up the slopes of Otaki Village’s Ontake 2240 ski resort. The event is being organized by the Tokyo NGO, Gaia Initiative, through their “+1 Forest Program”. The group has partnered with Otaki to help raise awareness about and support for the village and its forest environment. Details about the tour, which leaves from Tokyo, can be found here (sorry, Japanese only). In addition, individuals who are not part of the tour can have a chance to ride with and learn from Hashimoto. The cost for this is ￥5,000. In Otaki we are seeing in the landscape the first bitter-sweet notes of winter. During a hike in the back part of the Otaki Valley I caught a glimpse of Mt. Ontake 御嶽山 in white. The previous night it had been dusted with the first snow of the season. The mountain huts have closed for the season, but with the proper equipment and a bit of experience you can still climb the mountain. Down in the valley the leaves are well into their yearly display of color. Yellows and reds mix with the greens of pines to create variegated slopes that dazzle t he eye. I’m guessing the peak will be this weekend. Now, not only the nights, but the days too, are cold. A trip to the hot spring tastes even sweeter now, and delicious “nabe” 鍋 (pots of hot soup with meat and vegetables) have become a staple. Winter in the mountains can be tough, but what joys it brings. The above is the view from the summit of Mt. Ontake looking towards the northwest; Mt. 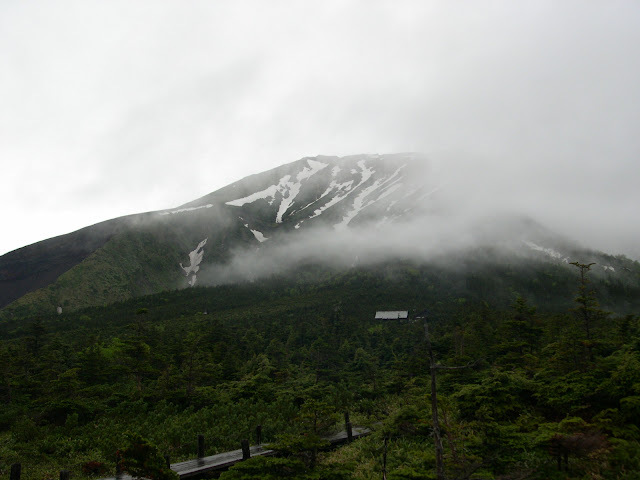 Norikura and Kamikochi lay in the dista nce. Fall is perhaps the best time to climb Mt. Ontake. The hillsides begin to turn a dazzling array of colors, and the weather tends to be stable. Clear skies offer other-worldly views of the North, Central, and South Japanese Alps, as well as Mt. Fuji, Yatsu-ga-dake and beyond. Staying in a mountain hut at the summit is an extra treat. The cost is reasonable (about 9,000 yen with dinner and breakfast included) and the accomodations nicer than one might think. Step outside on a clear night and it looks as if you could run your fingers through the Milky Way. The lights of Nagoya are also visible at night and seem close enough to step into. The mountain huts are beginning to shut down for the season and the snows will be coming soon, so come while you still have the chance. The long weekend (October 10-12) may be the best opportunity to climb before the snows come. and take great delight in our presence. Buses to Ta-no-hara 田の原 (where the Otaki route begins) run from Kisofukushima station 木曽福島駅. The cost is 1,500 yen one way. Extra days have been added for the fall. Find the complete schedule here. Web page and phone number for the mountain hut at the summit of Mt. Ontake (ken-ga-mine 剣ヶ峰) here. Give them a call, they’ll keep a room warm for you. For details about Shizen–ko and kayak tours please call or visit the website of Ontake Adventure (おんたけアドベンチャー). Spring is well on its way, even in Otaki. Though the nights are still chilly, sun-drenched days are coaxing buds from the mountain’s trees. Still no green, however. Patience is a virtue deep in the mountains. With the coming of spring comes the opening of the road leading to Otaki Village’s Ta-no-Hara 田の原 nature park. The park sits at Mt. Ontake’s seventh stage (of ten) at around 2,500 meters. The park provides great access to the mountain, which can be climbed in a day. A word of caution, there is still a lot of snow at Ta-no-Hara. Care should be taken by drivers especially in the morning and evening when the road can still freeze over. Of course, care should also be taken by anyone climbing Mt. Ontake in this season. Proper gear is essential. The road leading to Ta-no-Hara will open from tomorrow, Saturday, April 25th. It’s a beautiful season to visit Otaki and Mt. Ontake. Come, and enjoy!! A March 31st article in the Shinano Mainichi Shinbun 信濃毎日新聞 introduces a plan to create a hyakusou-no-mori 百草の森 in Otaki village. The project is a joint venture between the Otaki village government and the “Nagoya Citizens Ontake Vacation Village” (Nagoya-shimin-kyuka-mura 名古屋市民おんたけ休暇村), which is located in Otaki.